I sat next to a well-known cozy author at a library event. She regaled me with tales of the early days, when her New York publisher sent her on book tours, picking up the tab for travel and nice hotels. It was like meeting Snow White and hearing about the fairy tale castle and Prince Charming. That was then. This is now. Even if you have a contract with a major New York publisher, very little will be done for you promotionally. With a medium to small press, your publisher may submit your work to reviewers and contests, and advertise your book on their website. The only people who are sent on grand book tours at the publisher’s expense are the people who are making the publishers enough money to justify those promotional dollars. In other words, the people who don’t need the help. What Works? Writers agree that it is nearly impossible to quantify promotional efforts. What works for one person, book, genre or region may not work for another. What forms of social media do you already use? Facebook, Twitter, Pinterest, Goodreads, others? Then by all means continue. When people tell you that you won’t sell books unless you (fill in the blank), run! The good thing about most social media venues is that you can use them at no cost. Wait a minute? What did I say? No cost? Using social media costs you – what? YOUR TIME! Rule #1 – Treat your time like gold. Budget your time even more carefully than your money, because it takes time to write that next great story. Spend your promotional time on what you enjoy. Radio shows need guests. Local television and library cable channels often have author spotlight shows. There may be a few newspapers that still publish book reviews and interviews. Many libraries offer programs featuring authors. Try to get your name on the list of presenters. What is the promotional benefit? You gain exposure to an audience of dedicated readers. You meet librarians, who may buy your book for their shelves. You may have the opportunity to sell books. If you decide to hire a publicist, get personal recommendations from authors you know. Decide in advance how much you can afford, and what you expect for your money. I hired a publicist for book two in my series after I realized how much time I spent arranging my own blog tour for book one. We had a very specific contract for the modest blog tour. Hiring a publicist freed up my time to write fiction. I hear on writer’s loops about dozens of opportunities to buy advertising. From conference brochures to Amazon ads, Bookbub, Goodreads and blogs, there are plenty of places to spend your money. I haven’t availed myself of paid advertising. The reports I hear are lukewarm. Caveat emptor – buyer beware. Rule # 2: Spend only the promotional dollars you can afford. Don’t put all your promotional eggs in one basket. Take only the risks from which you can recover. I love blogging. I know other authors who loathe blogging. I blog once a week on my website. I try to appear on other blogs, too. Be sensible, though. Why appear on a romance-oriented blog when your write science fiction? Writers appear on each other’s blogs frequently, which is fine for networking and giving back to the writing community, but you can only sell so many books to your fellow authors. Blogging, like social media, costs you – what? YOUR TIME! Direct people to where they can buy your work. Verify the links work. Announce your next project. Update your website at least once a month. A reader finding a dusty, outdated website will likely think you've left the writing business. Brand yourself and your fiction. My website has photos of donkeys, western scenery, geodes and fossils. Readers can see at a glance the type of setting they can expect in my fiction. I have seen pens, magnets, rubber animals, packets of flower seeds, cooking spatulas, and rubber bracelets printed with the author’s info and given out to potential readers. Do these sell books? Do they sell enough books to justify the expense? I believe bookmarks are valuable as a promotional material. Tell me about your book, and I’ll likely forget about it by the time I get somewhere I can make the purchase. Give me a bookmark or postcard with relevant information, and I might buy it later. Whether attending a free library event or a writer’s conference that cost you dearly, consider volunteering. I enjoy a conference much more when I can do something behind the scenes, or better yet, front and center as a room monitor or panel moderator. I am able to overcome my natural shyness when I am acting on behalf of the event, and people remember me. Only offer the time you can afford. Avoid letting volunteerism take over your writing time. What is your most valuable resource? YOUR TIME! Rule #1 – Treat your time like gold. Rule # 2: Spend only the promotional dollars you can afford. Rule # 3: Write the best book you possibly can. How do you keep promotion in perspective? Remember why you’re in this game. 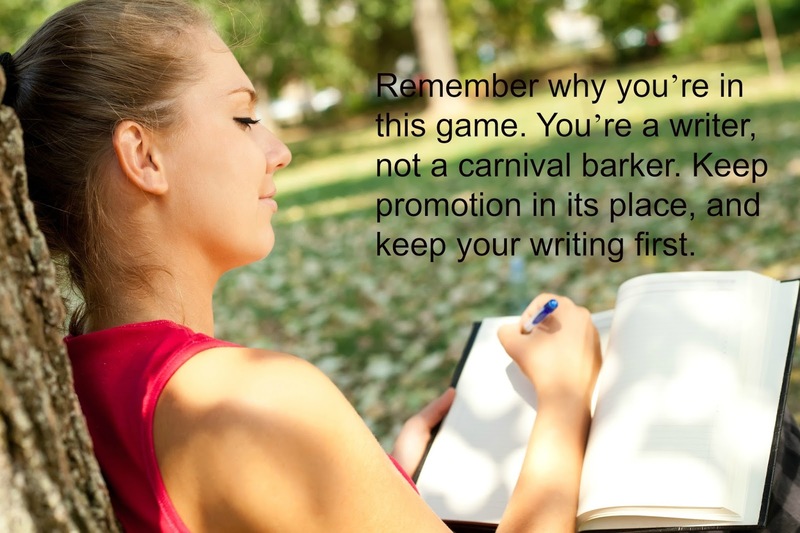 You’re a writer, not a carnival barker. Keep promotion in its place, and keep your writing first. About the Author: To Catherine Dilts, rock shops are like geodes – both contain amazing treasures hidden inside their plain-as-dirt exteriors. Publishers Weekly calls her novel Stone Cold Dead – A Rock Shop Mystery, an “enjoyable debut,” and that “readers will look forward to seeing more of this endearing and strong protagonist.” Catherine works as an environmental tech, and plays at heirloom vegetable gardening, camping, and fishing. Her short fiction is published in Alfred Hitchcock Mystery Magazine. Visit her at www.catherinedilts.com and on Goodreads. Thanks for putting this in perspective, Cathy. I have struggled with trying to find the right balance. I admit, I do dream about the good old days. I'm sorry I missed that ride! Great tips! I especially like the one about volunteering. I think doing something at an event would make me feel better and less shy as well. Hi Barb - We crave a formula or how-to manual telling us what really works, but there is little to guide us. I hear again and again that writing your next great story is the best way to draw readers! Hi Chrys - I do find that volunteering is a great way to force my shy self to mingle, as long as volunteerism doesn't use up too much of my writing time. Oh, these are all "I needed to hear them today" tips. Thank you for reminding us that we are writers first. I'm glad you enjoyed the article, Darby. Best wishes with your writing! Such common sense you possess, Catherine Dilts. Such a pleasure to run this article for Pikes Peak Writes. Donnell, I'm happy to "pay back" in a small way to a writing group that continues to inspire and guide writers at every stage of their careers.